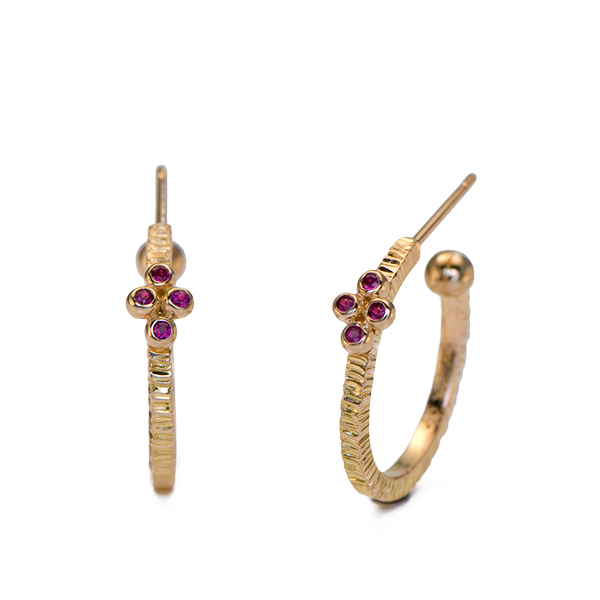 Earrings are set with Hot Pink Sapphhires (.16tcw) in 22kt rose gold granules on forged 22kt rose gold hoops with 18kt rose gold posts, 7/8″ in diameter. 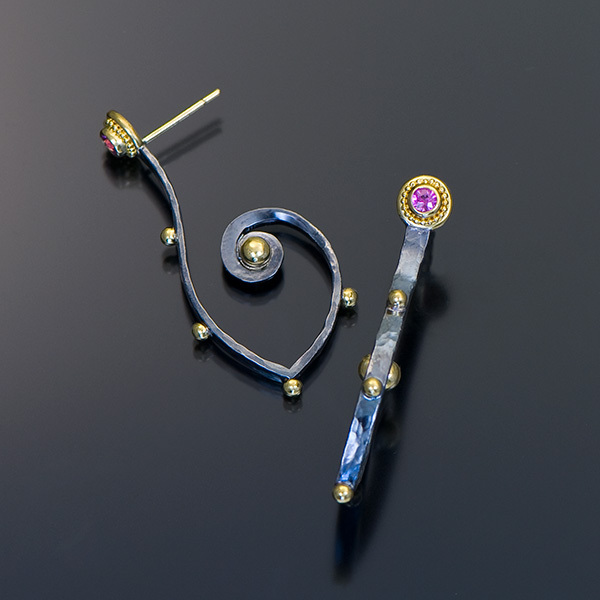 Earrings are set with Pink Sapphires (.26tcw) in granulated 22kt yellow gold with forged and oxidized sterling silver and 18kt yellow gold posts, 1.675″L x .25″W x .75″D. 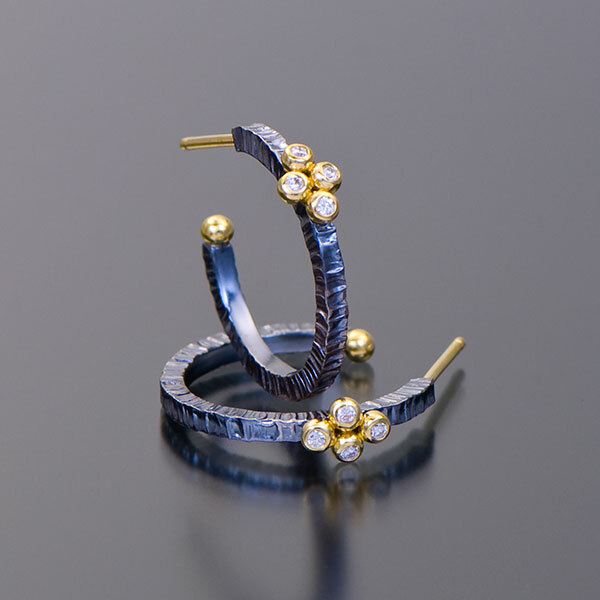 Earrings are set with Diamonds (.12tcw) in 22kt yellow gold granules on forged and oxidized sterling silver hoop earrings, with 18kt yellow gold posts. 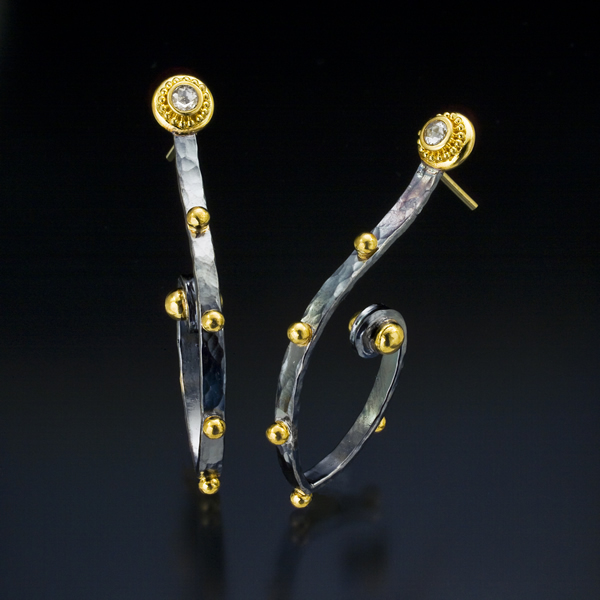 Hoops are set with Diamonds (.13tcw) in 22kt yellow gold on forged and oxidized sterling silver hoops with 18kt yellow gold posts, 3/4″ in diameter. 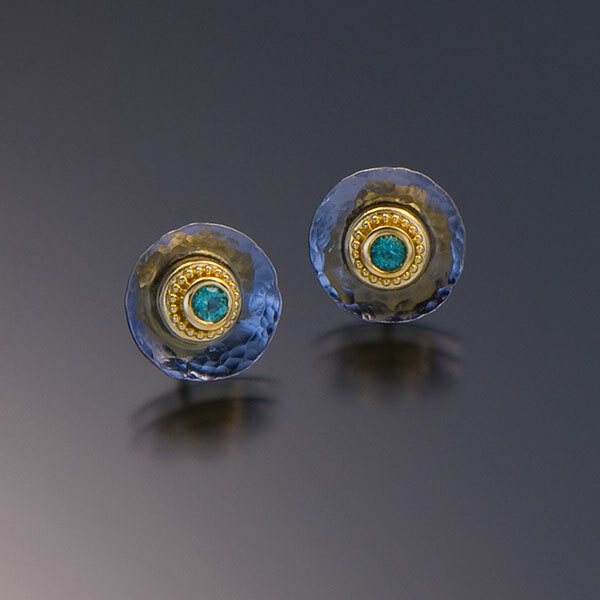 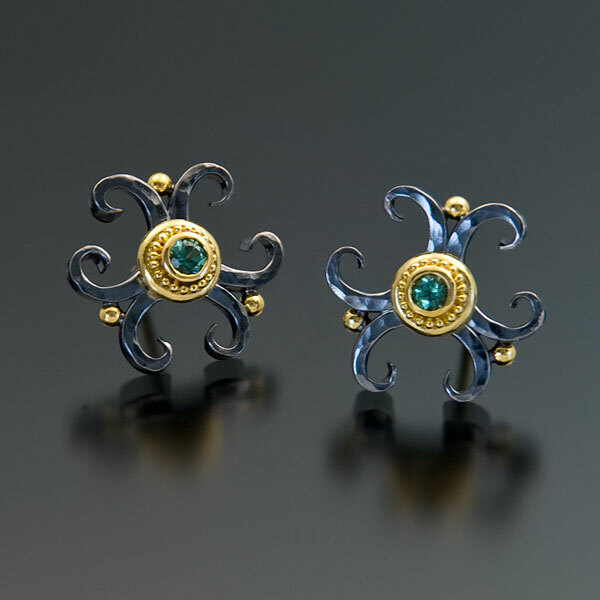 Button-style earrings are set with Green Tourmalines (.24tcw) in granulated 22kt yellow gold on textured and oxidized sterling silver with 18kt yellow gold posts. 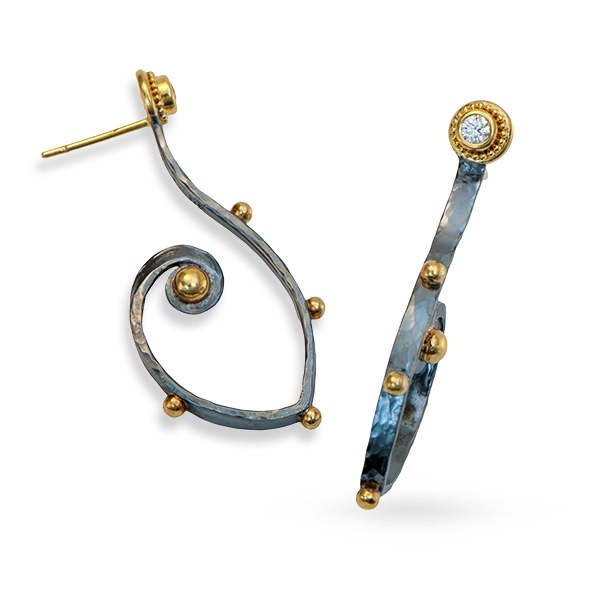 Earrings are set with Diamonds (.22tcw) in granulated 22kt yellow gold with forged and oxidized sterling silver and 18kt yellow gold posts, 1.675″L x .25″W x .75″D. 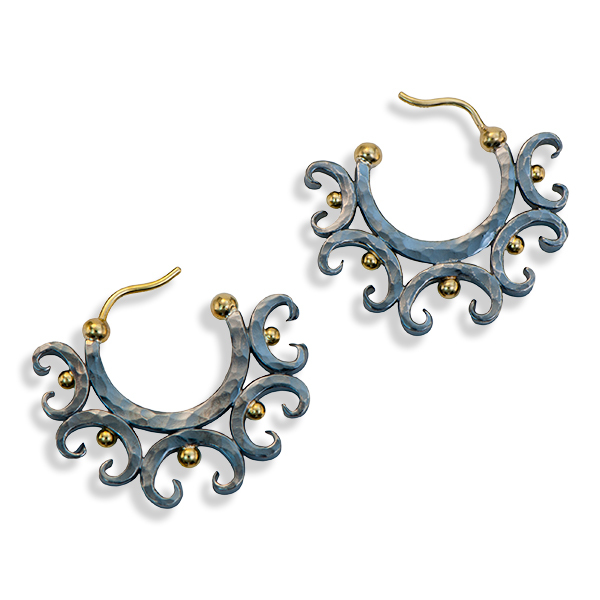 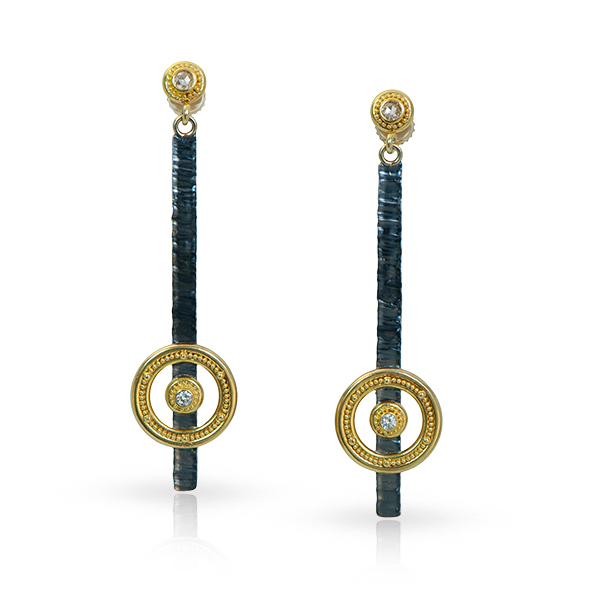 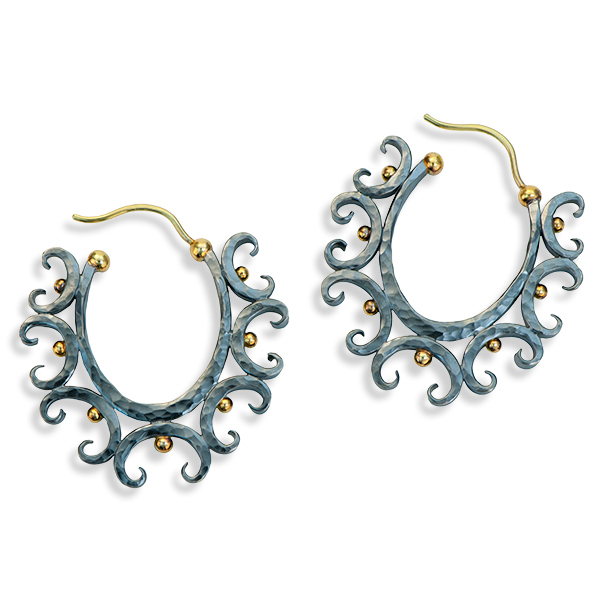 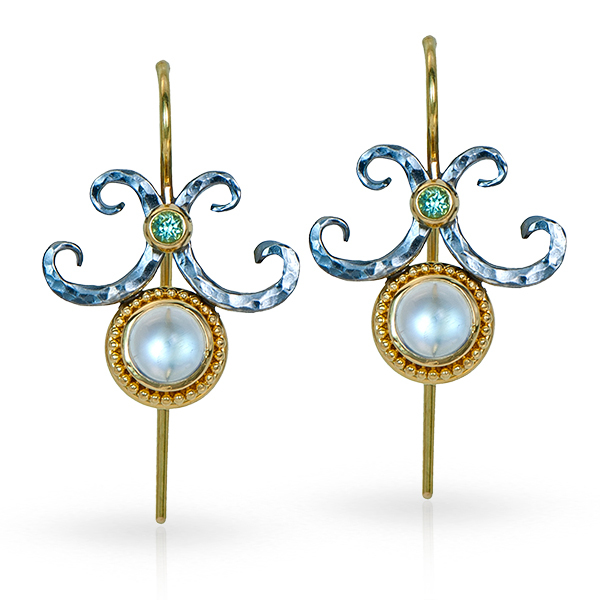 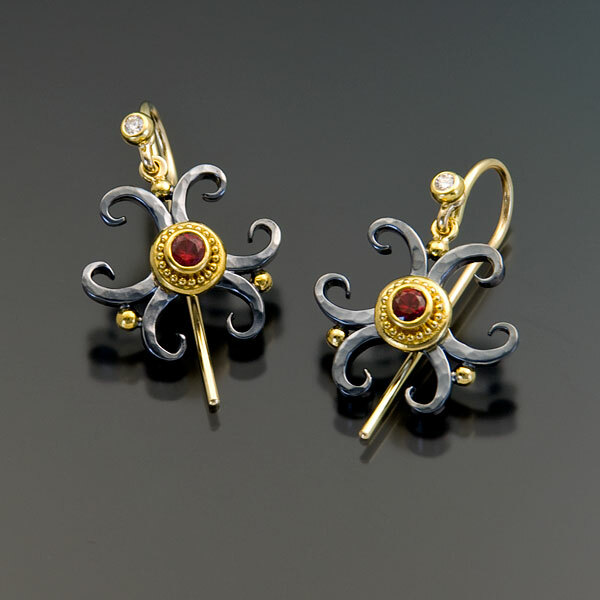 Earrings are in forged and oxidized sterling silver with 22kt yellow gold granule detail and 18kt yellow gold posts. 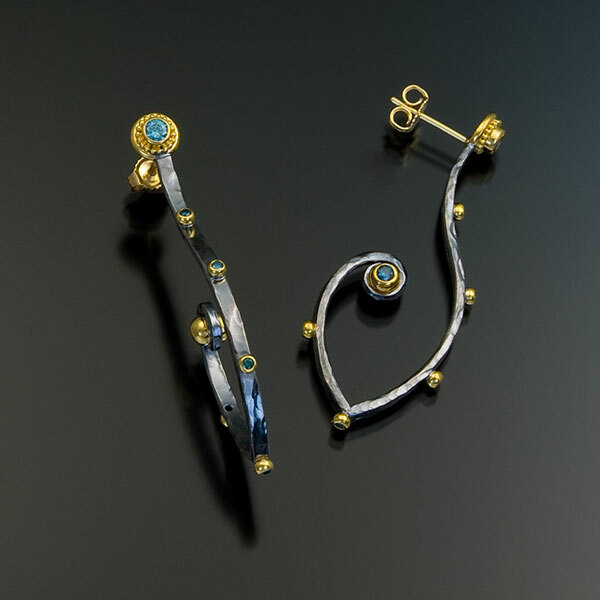 Earrings are set with Moonstones (6mm, 1.98tcw) and Mint Green Tourmalines (2.5mm, .14tcw) in granulated 22kt yellow gold with forged and oxidized sterling silver and 18kt yellow gold french hooks, 1.5″ L x .75″ W x .25″ D.
Earrings are set with Mint Green Tourmalines (.24tcw) in granulated 22kt yellow gold with forged and oxidized sterling silver and 18kt yellow gold posts, .75″L x .75″W X .25″D. 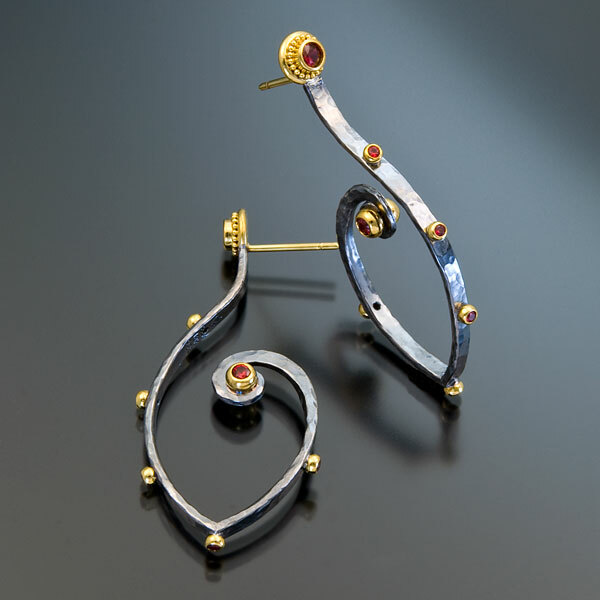 Earrings are set with Red Spinels (.26tcw) and Diamonds (.08tcw) in granulated 22kt yellow gold with hand forged and oxidzed sterling silver and 18kt yellow french hooks, 1.5″L x .75″W x .25″D. 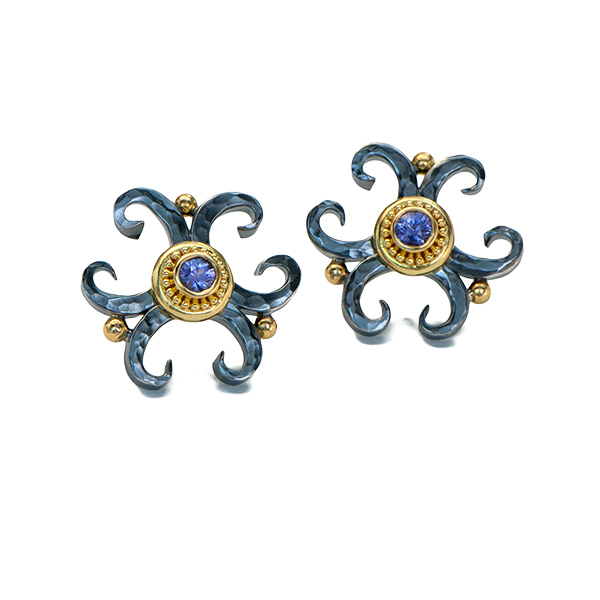 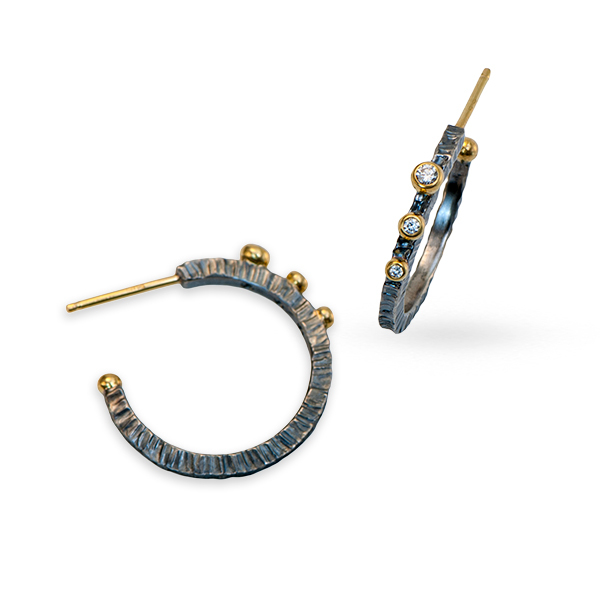 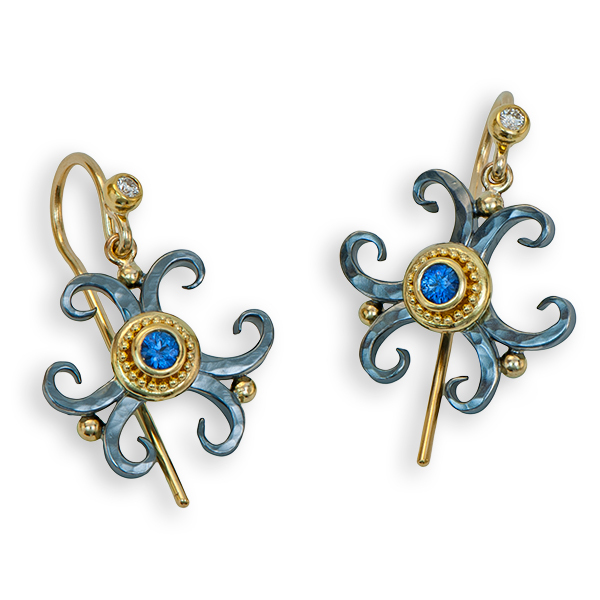 Earrings are set with Blue Sapphires (.26tcw) and Diamonds (.08tcw) in granulated 22kt yellow gold with hand forged and oxidzed sterling silver and 18kt yellow french hooks, 1.5″L x .75″W x .25″D. 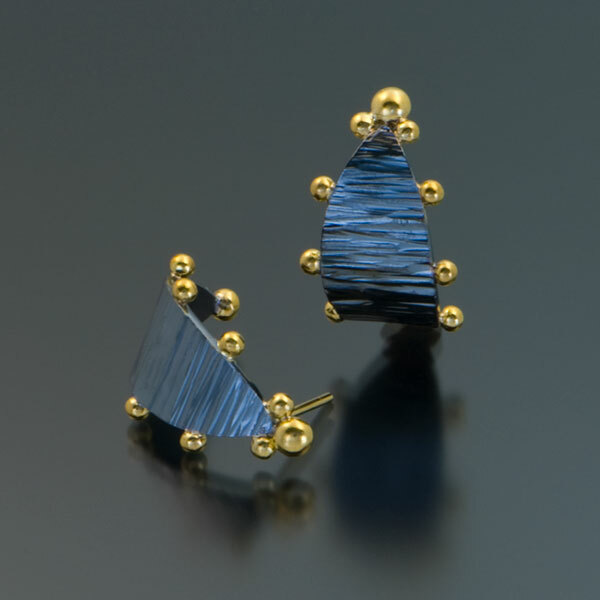 Earrings are in 22kt yellow gold with forged and oxidized sterling silver with 18kt yellow gold posts, 1 1/2″ L x 1 1/4″ W x 1/8″ D.
Earrings are in 22kt yellow gold with forged and oxidized sterling silver with 18kt yellow gold posts, 1 1/8″ L x 1 1/8″ W x 1/8″ D.
Earrings are set with Purple Sapphires (.24tcw) in granulated 22kt yellow gold with forged and oxidized sterling silver and 18kt yellow gold posts, .75″L x .75″W X .25″D. 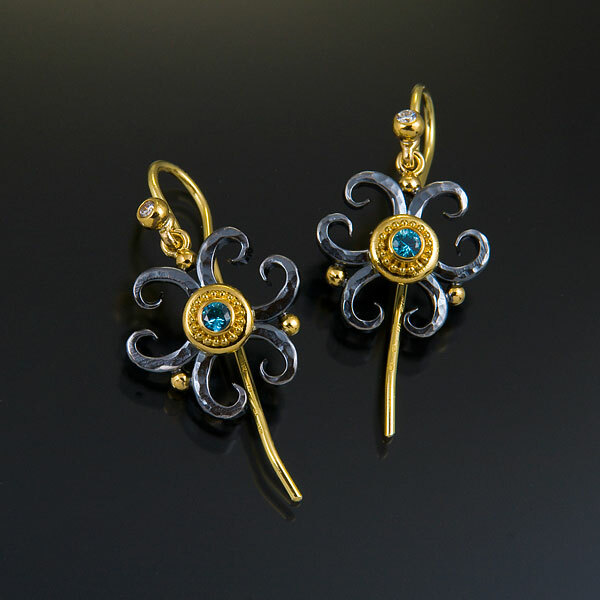 Earrings are set with Blue Zircons (.30tcw) and Diamonds (.08tcw) in granulated 22kt yellow gold with hand forged and oxidzed sterling silver and 18kt yellow french hooks, 1.5″L x .75″W x .25″D. 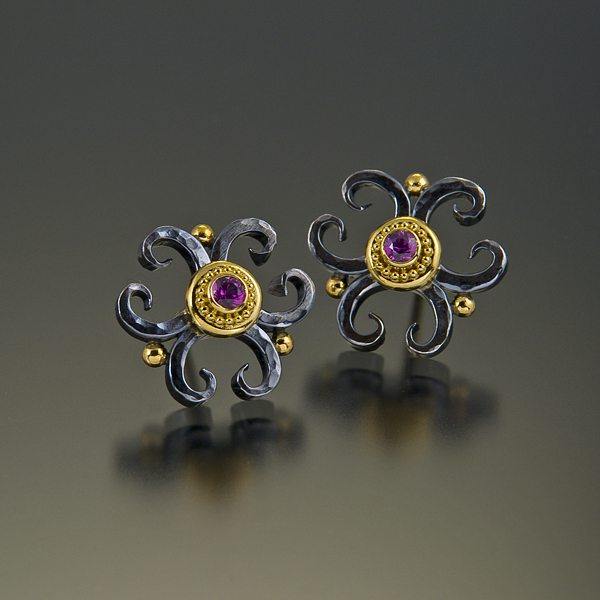 Earrings are set with Magenta Sapphires (.26tcw) in granulated 22kt yellow gold with hand forged and oxidzed sterling silver and 18kt yellow gold posts, .75″L x .75″W x .25″D.